Replace your current fluorescent bulbs and ballast with energy efficient LED tubes. Replace your current Metal Halide, HPS and Mercury Vapor Lights with our energy efficient and long lasting High Bay Lighting. Great for lighting building entrances, schools, outdoor hallways, stairs, apartment building and institutions. Ideal for outdoor applications, fits in various amount of fixtures. 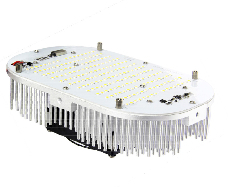 ​​​Get rid of your fluorescent fixtures, Metal Halide, Mercury Vapor and High Pressure Sodium fixtures and get energy efficient LED lighting. We offer a variety of lighting fixtures, bulbs, color temperatures, wattage and styles. Don't want to replace your fixtures? Many products are able to be use retrofit kits or will fit your current fixture. We will help to cut your cost and provide with an energy efficient product that fits your needs. Most of our products qualify to receive a rebate from the Hawaii Energy Program. Save Energy Hawaii is proudly a Clean Energy Ally with the Hawaii Energy Program. Great for both indoor and outdoor applications. Can be used in light posts, security lighting, high bay lights and street lamps. Click on Image to go to Product Page. **All Products are subject to change without notice. Great for outdoor locations, especially parking lots. Provides a wide beam of light. Great for indoor and outdoor locations. Used in many offices, walkways, breakrooms, bathrooms and warehouses.